A hip pan-Asian eatery serving unique contemporary dishes. 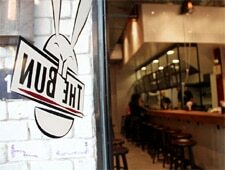 : The words “The Bun” written between the two front teeth of a large cartoon rabbit play amusingly off the masculine interior, designed with exposed Edison light bulbs, a wooden bar and metal shelving. Chefs Ayal and Shei Kitches bring their experience at high-end New York kitchens to their pan-Asian eatery. The duo’s skills are apparent in every dish, especially when it comes to the complex and unique sauces, braises and soup bases. For starters, the Thai papaya salad is a fine adaptation: vermicelli noodles are mixed with green long beans, fresh tomatoes, crunchy peanuts and strands of green papaya, and topped with an inventive fresh plum som tam sauce. Steamed buns are cleverly branded with the restaurant’s name; we recommend the Asian barbecue brisket bun with tangy miso barbecue sauce and homemade pickles. Or try the crispy chicken with its bold taste and sides of pickled vegetables and house-made rice cake. The Bun might be a casual spot, but the food is taken seriously --- these two fine dining chefs are serving dishes without a fine dining price tag.